We had a big time camping at the Navy Station at Mayport, Fl. Plenty of ships pass by our campsite, most often a dredge operating in the channel and car carriers. A tour of a U.S. Coast Guard cutter and a navy ship were highlights of our stay. A foggy start to an offshore fishing trip went well as we caught quite a number of fish. If you qualify, a stay at this military campground should be considered. 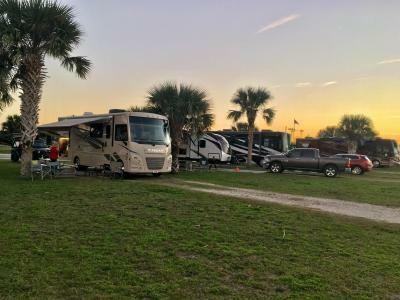 The campground is well run, clean and close to the beach and St. John’s river entrance to Jacksonville, Fl. We hope to get a chance to return soon. Our next adventure will be from our home in South Carolina to San Antonio, Texas to watch our granddaughter show her pigs at the Livestock show and Rodeo in February.